Conventional wisdom once said that organic solar cell efficiency would never break the 15 percent mark. Now, researchers from Nankai University have demonstrated an organic solar cell efficiency rate of 17.3 percent— the highest ever recorded of its kind. Traditionally, most commercial solar cells are made from silicon, a material that is stiff, unsightly and has many engineering limitations. More and more experts are starting to believe that the future of solar energy lies not in silicon, but in organic solar cells—also known as organic photovoltaics (OPV). OPVs, which are made from carbon and plastic, are cheaper to make and have far more flexible engineering applications. Literally flexible. OPVs can be made with compounds that are dissolvible in ink, which is then printed on to a diverse range of materials. This allows engineers to build semi-transparent solar cells into windowpanes, bend them to build on the roofs of aesthetically pleasing architecture and even put them into glasses’ lenses for users to solar charge their phone on the go. Despite the advantages, OPVs aren’t normally used in solar energy on account of their low efficiency rates. Where silicon photovoltaics convert between 18 to 22 percent of solar energy into electricity, OPVs have only been able to achieve half that rate. Researchers have been making big leaps toward higher-efficiency OPVs this year. In April, a team from the University of Michigan broke records with a commercially viable cell that boasted 15 percent efficiency, comparable to some of the silicon cells on the market. The Chinese team’s results, which were published last week in Science, were achieved by rethinking OPVs from the ground up. The team applied a tandem cell system, meaning that they built two solar cell devices in the same structure to target two different wavelengths of sunlight, thereby increasing the yield. “We have two layers of active materials; each layer can absorb different wavelengths of light. That means you can use sunlight in the wider wavelengths more efficiently, and this can generate more current,” said Yongshen Chen, PhD, who led the study. Chen believes the results mean that solar cells using the tandem solution may be on the market in under five years, as the commercial materials are already widely available. According to him, OPVs are similar to organic light-emitting diodes, which are currently used in high-end TVs. “These [organic light-emitting diodes] are already commercial, and they use a similar material to OPV,” Chen said in an interview with the BBC. Where some are optimistic that the new research will help propel commercial solar cell tech forward, others believe that the barriers to widespread solar energy go deeper than OPVs can solve. Despite surpassing an efficiency limit previously considered insurmountable, solar cell viability is still fundamentally bounded by inconsistent weather conditions and availability of manufacturing materials. Both OPV electrodes and silicon solar cells require silver—a precious metal of which there simply isn’t enough of to even make a dent in the global energy market. That being said, the relative flexibility of organic materials may mean that solar energy can be integrated into the infrastructure in new smart and appealing ways. 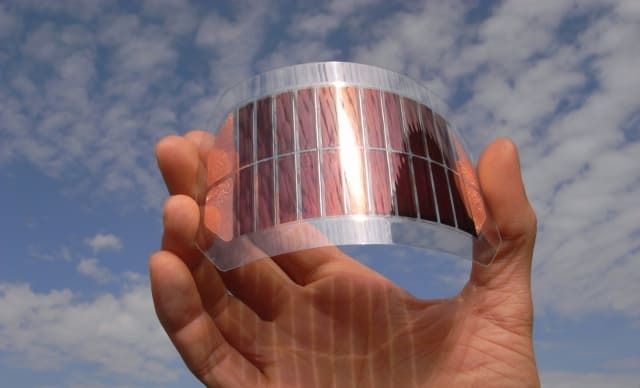 If solar energy has a future, OPV advances will likely play a part.